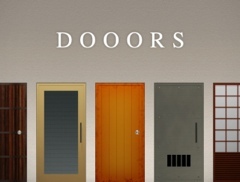 This a walkthrough for anyone who needs help with the room escape game, DOOORS. Please don’t copy it to any other sites, and please link to it if you find it helpful. Thank you. If you like this game, try the Lost City and Cryptic Caverns. Also, see my full list of escape games and walkthroughs. Door 1: Tap the door to open it. Door 2: Tilt your phone left to roll the ball and the door will open. Door 3: Tilt your phone left. Take the key that was under the ball. Use it to open the door. Door 4: Pull the handle hanging from the ceiling on the left side. Tap the door when you see the opening, before it closes again. Door 5: Tap the left-most lamp to lift it up and take the doorknob from underneath. Use the knob on the door to open it. Door 6: Tap the little glowing light on the left. It’s a light switch. Keep tapping it until all 6 lights above the door turn green. Now you can open the door. Door 7: Make the circles next to the door match the squares on the door (red = white). 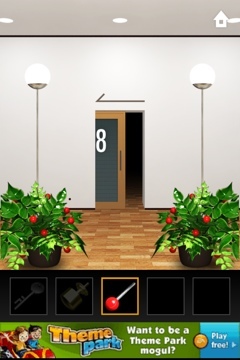 Door 8: Pick up small red thing above the left plant. Select it from your inventory and use it to slide the door left (note the arrow above the door). Door 9: The left door moves slower than the right door, but never stops. Tap the right door to get it to make one rotation. You need to time it right so the circular cutouts in each door hit the green area at the same time. You also have to tap the door at that exact second for it to open! It just takes trial and error. Door 10: Shake the screen to put out the fire. Lift up the burnt wood and take the crank from underneath. Then tap the plants on the left a few times to move them. The middle circle on the wall has a space for the crank. Slip it in the hole and then turn it to open the door. DOY! I can’t believe level 24 was THAT easy to solve! give numbers 1.2.3.4 then 4.3.2.1.2.3.4 –> open the door! Swipe the door in the direction of the duck or rabbit, in order shown above the door. how do i make the ball double jump??????????? 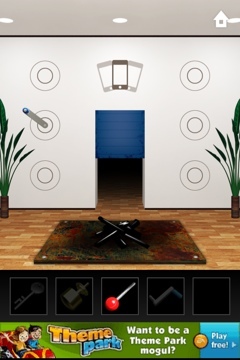 I cant solve level 24. Can anyone help me? Anyone can help with level 24? @cynthia click for example the left button and the left ball jumps. When the ball reaches the highest point click again on the button. @mairy and anomis Light the fires with the torch. Pull the handles from right to left and back. If the handles would have numbers it would be like this. 4 3 2 1 2 3 4. You look like you know what your doing! How do you set the man on fire in level 16?!?!?! Thank you!!! You don’t set him on fire. But you can have fun using the torch on him if you’d like. Purely optional. How do u beat level 26 if u only have one chain!? How do you pass level 22? I can’t solve Level 24, i don’t understand ! Help me in english much easy, i’m French ! First you Light both fires with the torch. Then pull the rightmost handle, then pull the leftmost handle and continue down to the right one, then back all the way left and back all the way right. I still can’t do level 20, it’s starting to stress me out, especially as the smoke keeps on getting in the way :/ help?? Level 20 you look only the red color. On the left side don’t do anything so dial the right that reflection of those on the left. Make sure you slide the door to the right. 28 with volume buttons does not work? Check your sound button. It didn’t mute. Btw you try load this level again. If you look carefully at the symbols above the “volume bars,” you can make our 2 setc of 2 numbers. The are very tricky to read, but they are there. Can’t do the second clock on level 34 🙁 don’t know what’s wrong with it!!!!! On level 34 you hold on your iPhone in the same direction as the rotating hands of a clock. Just try. On level 34 it doesn’t light green when I tilt it on the second light. Help? Thank you so much 🙂 make me passed all those levels easily. On 31 holding my phone upside down is doing nothing. How do I get it to work? Do it several times until all lights turn into green. It’s not working for me, although I am enjoying torturing the man with the flame and the knife. Hey I’m having trouble with 25. How do u get past it? 27 dose not work! Help me! Cant figure 28 out. Please explane! I can’t solve number 9.
me too! 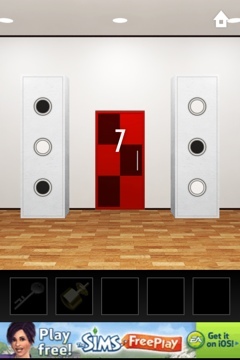 i cant solve door 15!!! helppppp!!!! 🙁 i have done what it says to move ball left and right and pull on handles respectively but door still no reaction! for level 15, pull the handles according the arrow from the top one to the bottom one. finally, I did it. There is a bomb in the left corner of the screen – tap it and it will pop up in your “supplydock” tap it again and place it in front of the door. Tap the torch and light the bomb, the bomb will explode and leave marks on the sides of the door. I can’t open door 41. I’ve been shaking it for like 5 minutes . Maybe i’m shaking it wrong . PLEEEEASE help . Please help.. Number 28 doesn’t work!!! Tried the volume button (ringer). Stuck with 13 ! Please help ! You need to shake the screen and the door will open.Then you will see a cobweb,click the fire and you will see it in your inventory. Once it is there click on it then the cobweb and the door is completely open. I still cant get 24. Someone help me me pls the instructions arent clear enough. How do i pull the handle from right to left?